Jeromians of Bagabag Site | We write high story just like he did! I’m not campaining for 2016 election politics, but I just like to share the information about the future leaders of the Philippines compiled by rappler.com website. Follow the original link URL at the said website. We would like to request everyone to be punctual as the event will start at exactly 6:00 P.M. This year is the last valentine’s day of Kobe Bryant (Laker’s No.24 and 8), and All-star game appearance as he announced last year his retirement this 2015-16 NBA season. I just like to add my personal opinion about his basketball career that is not comparable to anybody, by not just considering performances in the basketball court. Statistically, he is nearly compared to Michael Jordan of Chicago Bulls, who reached NBA finals after seven years of experience. Like Lebron James (CAVS#23), who did not also go to college because of NBA career, Kobe stepped to the NBA finals arena after five years of career. The only difference is, Kobe got his first ring while James did not (Cavs_vs._Spurs). But, one thing I love with Kobe is his loyalty to Lakers’ fans for staying with the team until his twilight years. Aside from being “rookie of the year”, I can’t expressed anymore words for Kobe, just correct my table of comparison among the 3 greatest NBA players of all-time. Thanks to the site http://doin-work.com/2010/02/14/happy-valentines-day! to athlethic or talented players. The first games became a friendly match between the Jeromians_of_the_80s (Bagets team_name) and addition of 4 SJA90 players and the Solid Team of SJA Class ’92. It was a closed match and the Bagets team won with double digits score. The Navy Blue Team, led by Darwin Torio and became the first Best Player of the Game, won more than 10 points against the Maroon team lead by Kgd. Ben_Calauad, who opted to wear Yellow jerseys instead of Maroon. Thanks to former Kgd. Parotina and other referees who officiated the game. Special thanks also to Mr. Alex_Guiab (SJAHS 1986 freshmen) who acted as timekeeper of the game. 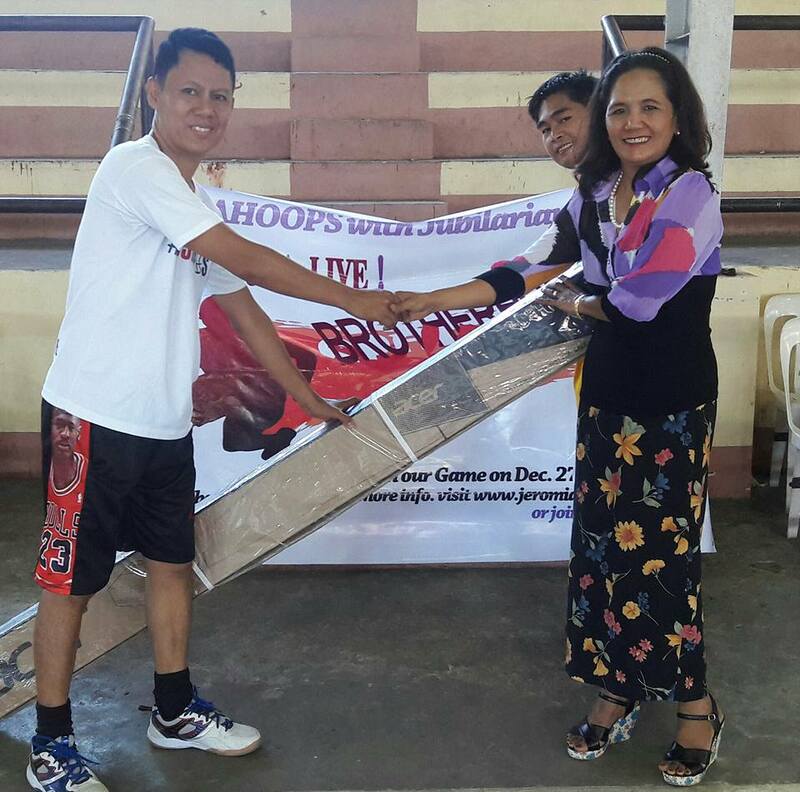 (L-R) SJA89 and SJAhoops mover, V. Rebuta with Madam Bay and SJA Batch ’01 Ben Calauad at Bagabag Gymnasium on Dec. 27, 2015. As a graduate of class 89 of Saint Jerome’s Academy, I told Fr. Theo that my projector screen gift for his 89th year (November 3, 2015) will be donated to SJA High School department particularly for Senior High. And he gave me an answer “ let us remain united in 2016 and pray for each other”. Not just as kind school administrator twenty years ago, I like to commend his leadership in establishing the SJA Parish Credit Cooperative Incorporated or the “”SJAPC coop”. This institution has already it’s own building situated at the back of SJA High is more than years already and the member are still growing. The gift I gave to reminds my college days wherein the SJAPC coop extended financial services to my parents as borrower/member for my educational finances. After I graduated in college, I also joined the said institution as borrower. I think other families experienced too as borrowers that helped their students graduate in high school and college. Since there was no commercial bank before in town, the easiest way to borrow money is through SJAPC coop. One of my reason to donate such equipment is to help SJA HS in completing the new K-12 facility requirements for senior high level. DAY_1: At 5:25 pm January 15, Pope Francis arrived at Villamor airbase, Pasay City. When the airplane landed he was warmly welcome by all people who are happy to see him. All Christian Catholic people cannot wait and very excited him to get down on the plane. Pope Francis at first, he is just peeping on the window which makes all the people missed him so much. When the door of the plane opened and he get down he was welcomed by Pres. Aquino and VP. Binay, Cardinal, Bishop, and lay people and other members of the cabinet. He was given a high honor of excellency by cadets in uniform and youth dancer. Especially by the catholic people through shouting of words “Pope Francis we Love you”. When Pope Francis ride to his Pope Mobile and do the motorcade going to Apostolic nuncioture where he will stay, different emotion expressed by all people. All of them were very excited and very happy I do feel the same way too. I also pray that he will accomplish his mission in our country. DAY_2: On the second day of Pope Francis that was January 16, he went to Malacañang Palace to visit our president he was signed to the guest book witnessed by our president after that they entered to private room to talk about other issue and business. When all was done to the Malacañang he proceed to Manila Cathedral and gave holy mass to the cardinal, bishop, priest and nuns. He expressed the importance of the catholic faith and teaching of jesus Christ spread to all people. He also blessed the disable nuns. He done also a side trip to orphanage home which is nearby the cathedral. As I watching this on television I attentively hear and understand his mission in our country. On the afternoon of that same day, he went to SM-Mall of Asia Arena for meeting with the families. He meet different families of the poor and share different life experience and state. He emphasize the importance of family in the society, then importance of together of each member of family especially the migrant worker. DAY_3: January 17, Saturday, Pope Francis went to Tacloban City which is his main purpose of coming here. He would like to meet the Yolanda victim and show them the Compassion and Mercy of Jesus Christ. By celebrating the holy mass and giving inspirational homilies to all the people of Tacloban. Although he did not accomplish all the schedule plan due to bad weather condition because of typhoon “Amang”, Pope Francis have his prayer and support to all Yolanda victims. Pope Francis leave Tacloban at 1pm and he arrived at Villamor Airbase by 3:10 pm. DAY_4: January 18, Pope Francis went to University of the Sto. Thomas (UST) for Encounter with the youth. He celebrated Holy mass and listen to the sharing of students and children of out of school youth who were kept by an orphanage now. He received all their gifts and presents. Pope Francis expressed the importance of God in life despite of modern technologies and inventions like gadgets. Jesus Christ must be center of our life. And also the cries and weep of all women as a sign of women’s expression of Christ believers. In the afternoon of the same day he celebrated his last holy mass at Quirino Grandstand, the 6 million people attend this mass have given trust and strong faith to Jesus Christ, even they experienced wetness due to rain they never get tired waiting to attend the holy mass. He was also given by praise and thanks by bishops and cardinals. Again the motorcade happened Pope Francis again show his unli smile and blessing to all Catholic Filipino people. Note: This report is compiled by Tofi Rebuta. Thanks for sharing! I’m expecting a physical fitness activity in our batch anniversary celebration last Dec. 28-29, 2014 and unluckily no one even think about it. The first day of class reunion was attended by almost 30 alumni. It was a red and blue colored silver anniversary celebration. But I only attended out the first day with a red-colored shirt gathering at Decabacan, Diadi due to some commitment set earlier. Personally, I only think of one color for silver anniversary and that’s gray (silver grey of Lifeline brand). For consideration of the class 90 silver anniversary this 2015, I found silver grey with Lifeline brand available in Divisoria, Manila. At Decabacan, I met Tinong Miran (B88), whom I known to be a good basketball player since 1989. Kiddingly aside, I tried to challenge him for a match-up with our batch and he accepted it. On January 18, twelve jeromians played in SJA quadrangle and thanks God it’s a cloudy day. I wish I can start giving donation for the construction of basketball court’s roof if other jeromians will help. Most of the players are 40+ of age aside from Ryan of Batch 2007 and Bob of class 2010. We played 6 times without referee and I think we (class88 and Class89), can still have a good play. There was a suggestion from the group to repeat the activity in order promote active life and sportsmanship. I think I found a new venue where to encourage jubilarians to celebrate their Silver anniversary with physical fitness activity. The day after, I met Mr. Bulan of Batch90 and told about the basketball game. He suggested to have a tune-up game with their batch on March. This will be a next challenge to my part to coordinate with other alumni who are into basketball sports or fan. Specials thanks to SJA class 92, who have the most number of players during that game. Thanks to Alex D., Zinkee and Mr. Bacani (all 3 are non-jeromians) who also played against us. As I age I become more health conscious and physical activity is very important to me. I do hope the alumnae will have their own way too to testify the title of this article. If you want to join jeromians basketball brotherhood, register here. The Batch92 – Pol Andaya, Orville I., Edison N., Rodrigo M., Dominador M., Nanie Sioco and Anthony dela Fuente. Belated happy birthday to Fr. Theo. I went to visit his place last November, but unfortunately he was not there. At 88 years of age, he still conduct mass to the nearby community at CICM place Quezon City. I visit him every quarter of the year and he seems to be strong and healthy. I’m not sure if he still diabetic since we celebrated his birthday two years ago at CICM. As far as I know, he was the longest parish priest of Bagabag, that’s why I have to pay respect especially when I passed by near on his place. The other reason why I visit him is to seek for personal advice on how to follow the footstep of St. Jerome and the right path to the way of life. I think his words to be remembered for all is the definition of SJA, which is means “Show Jesus Alive.” As catholics celebration, 2014 is the year of the Laity, it is not easy to do how to show that Jesus is real and alive. This is a great challenge to my part as jeromian and I do hope other jeromians too from bagabag will help me in this way to christiandom. As a jeromian follower, I’m thankful to my batchmates in High school for giving me a chance to socialize with them since 1989. Unlike before that it’s really hard for me to go on social gatherings because of some strictness of my parents. Today, I’m looking forward to meet them and have some fun because I love to work with them in aspiring golden years of age. Since 1989 and during our college days, we have lots of fun memories even we only use pagers and telephones in communicating with each other. I’m lucky to study in Manila because I can dial-up a telephone of Adele with .75 cents only and ask for fellow jeromian’s gimmick. Our class is special and incomparable from other class of SJA Bagabag. We have major contributions to our alma mater like funding scholarship in High School and continued support by giving donations or pledges every alumni homecoming. Aside in helping SJA, we established the Bagabag Batch 89 Foundation and done various projects in the community during the 90s. Some of my batchmates now are doctors, lawyers, government leaders but most of them are working in the academe like my bestfriend Andy. Even we have now our own families and it’s really hard to meet them, I am lucky enough to have harmonious relationships with them. They are my colleagues in soaring the golden years in life. Today is the best time to thank my classmates who are very supportive to me and to my online business, the novovizcayano.net and jeromians.net. In fact, they help me establish to become a blogger and that’s reason I volunteered as organizing team for our silver anniversary on December. The planning workshop is scheduled on January 31 here in Manila. If you like to be one of us, please contact me 0923-2381855 or 0916-2373335. It was a nice surprise to Fr. Theo when he met more than ten jeromians last July 28, 2013 in his place in CICM (Q.C.). We, together with Marissa Barzabal-Bayaua, did the invitation only almost a week only. I believe that most of us now is connected online so other are informed immediately. It was a KKB sharing of food and most of the attendees are from San Geronimo. I wish we can have bigger event in celebrating the birthday of Fr. Theo on November 3. Please do share this information to others. I think we need a fund drive for Fr. Theo’s health condition. My gift to him is a maroon shirt with print “I love SG“. If you like to have one, just contact me. Note: Please prepare P200 for food and venue preparation. We will hold the event inside the CICM compound. If you have some suggestion, please leave a comment below. Thanks!